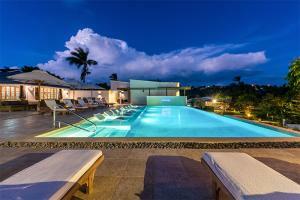 This resort offers unparalleled island luxury, modern amenities and a warm and welcoming staff. Suites are equipped with a host of modern amenities and showcase beautiful patios or balconies. Many of the suites feature private pools and breath-taking views over the gardens to the Caribbean Sea. The resort offers easy access to the Underwater Sculpture Park, Hog Island and Seven Sisters waterfalls. Whether it's exciting water sports or relaxing on the idyllic beaches, this hotel offers something for guests of all tastes. Located beach side in St Georges and just minutes from water sports, activities and attractions.